The latest American Architecture Awards honor one design for a Seattle high-rise — but unlike a handful of other local projects receiving the prestigious award, this one isn’t being built. For anyone hoping to see some more memorable architecture in the phalanx of residential and office high-rises marching across South Lake Union, there’s good news and bad news. The good news is that a two-tower design for a Seattle site at Minor and Stewart streets has received a 2017 American Architecture Award as one of 79 notable new projects by U.S. firms. The bad news is that it’s just a design, not something that will actually be built. The award went last month to WATG Urban, where Dennis Rehill is vice president and design director. He worked on the design several years ago while at the Gensler architecture firm; when he started a local office for California-based WATG, “we continued to explore this idea,” Rehill says. 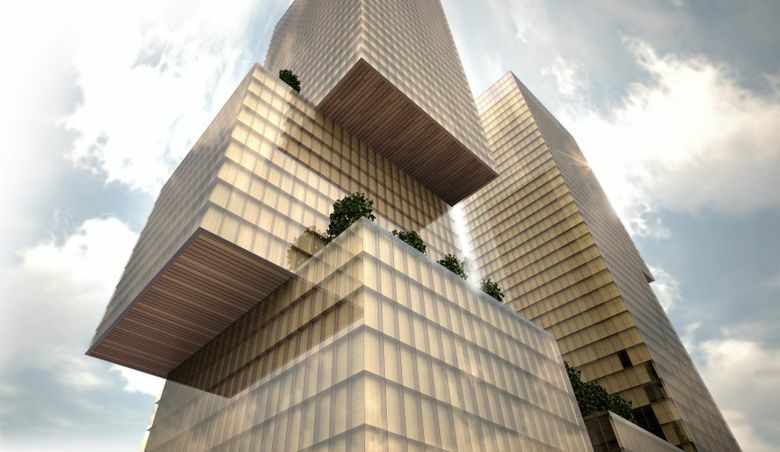 The winning design for the 440-foot towers shows a series of shiny, cantilevered boxes, broken up by greenery on large, high-up patios created where the boxes are shifted. It’s not the most radical design concept, but would be a welcome contrast to the unbroken glass facades that mark most recent high-rises here. 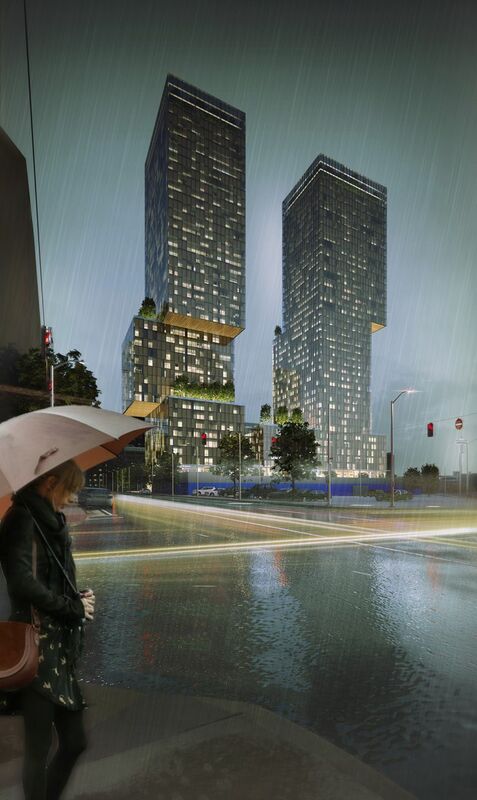 But that apparently isn’t in the cards for the site at 1901 Minor Ave. Crescent Heights, the big national developer that owns the property, is still working on a master use permit for the site, says Case Creal, project manager at Gensler, the architect of record. The latest design review documents for the site, dated last August, show a simpler design with one inset ‘notch’ to provide some open-air ‘amenity space’ partway up each tower. WATG also was honored for a bridge in Hanoi. “It’s a very hard award to get, so we were very excited to get two this year,” says Rehill, whose current work includes projects in China, Vietnam and Hawaii. One benefit of the overseas investment dollars pouring into Seattle commercial development is that it “will eventually raise the bar” for architecture in big residential projects, he predicts. LMN Architects’ light-rail station at Husky Stadium was honored in the airports and transportation centers category. Other award winners were a residence in Seabeck, Kitsap County, designed by mworks; Olson Kundig’s repurposing of a onetime Dr Pepper bottling plant in Georgetown for the Charles Smith winery; and Graham Baba Architects’ headquarters for the Washington Fruit & Produce Co. in Yakima. Unlike the Minor and Stewart project, those have all been built.